This page is going to move.Please click on the link below to transfer to the new location. He met a jugglery in a workshop, when he belonged to a dramatic company. 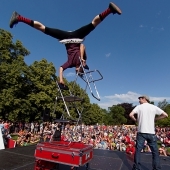 While giving some street performances, he had been learning the skills of “Clown”, ”mime” and ”Acrobatics”. 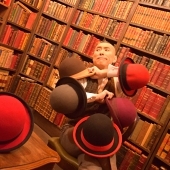 Now he gives many shows with original ideas and various skills by his own direction. The show is always full of laughter. The audience will absolutely enjoy Hiyro’s performance as if read a comic book. Amazingly, everyone from children to adults can enjoy it!! 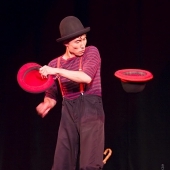 Is he a “juggler”, a”Clown”, or an ”acrobat”? You should enjoy with Hiyro’s gag and comical act!